(Phys.org) —Researchers at the University of Arkansas have identified that water, when chilled to a very low temperature, transforms into a new form of liquid. Through a simulation performed in "supercooled" water, a research team led by chemist Feng "Seymour" Wang, confirmed a "liquid-liquid" phase transition at 207 Kelvins, or 87 degrees below zero on the Fahrenheit scale. The properties of supercooled water are important for understanding basic processes during cryoprotection, which is the preservation of tissue or cells by liquid nitrogen so they can be thawed without damaged, said Wang, an associate professor in the department of chemistry and biochemistry in the J. William Fulbright College of Arts and Sciences. "On a miscrosecond time scale, the water did not actually form ice but it transformed into a new form of liquid," Wang said. 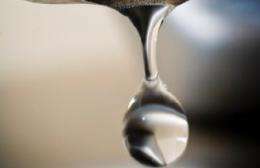 "The study provides strong supporting evidence of the liquid-liquid phase transition and predicted a temperature of minimum density if water can be cooled well below its normal freezing temperature. Our study shows water will expand at a very low temperature even without forming ice." The findings were published online July 8 in the journal Proceedings of the National Academy of Sciences. Wang wrote the article, "Liquid–liquid transition in supercooled water suggested by microsecond simulations." Research associates Yaping Li and Jicun Li assisted with the study. The liquid–liquid phase transition in supercooled water has been used to explain many anomalous behaviors of water. Direct experimental veri?cation of such a phase transition had not been accomplished, and theoretical studies from different simulations contradicted each other, Wang said. The University of Arkansas research team investigated the liquid–liquid phase transition using a simulation model called Water potential from Adaptive Force Matching for Ice and Liquid (WAIL). While normal water is a high-density liquid, the low-density liquid emerged at lower temperatures, according to the simulation.